KABUL, Afghanistan -- Three U.S. nationals were wounded on Thursday in a shooting at the residence of the governor of Afghanistan's Kandahar province. 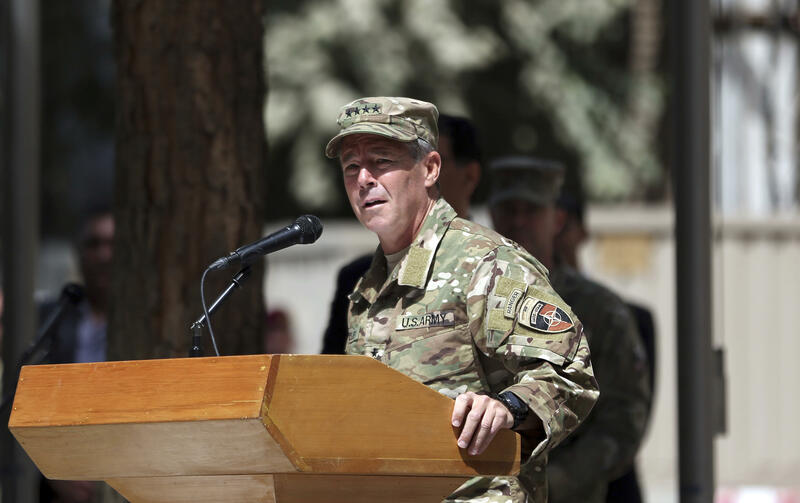 Top U.S. commander in the country, Gen. Austin Scott Miller, was attending an event with other U.S. and Afghan officials at the governor's palace, but he was not injured, the Pentagon said. One of the U.S. military's most valuable allies in the region was killed, however, along with two other Afghan officials. "Initial reports indicate this was an Afghan-on-Afghan incident," Col. Knut Peters, a spokesman for the U.S.-led Resolute Support mission in Afghanistan said in the written statement. "We can now confirm three Americans were wounded - one service member, one civilian and one contractor," Peters told CBS News Radio correspondent Cami McCormick. "General Miller is uninjured." Kandahar's deputy provincial governor Agha Lala Dastageri said powerful provincial police chief Abdul Razik and the province's intelligence chief Abdul Mohmin died immediately in the attack and provincial governor Zalmay Wesa died of his injuries at a hospital. The Taliban claimed responsibility for the attack and said Raziq was specifically targeted. The Taliban claimed it was an "insider attack" -- one carried out by a sympathetic member of the Afghan security forces. The militant group sent a photo to journalists of a young man in an Afghan border police uniform, whom it identified as the attacker. Gen Raziq has been a powerful American ally in southern Afghanistan. A potent foe of the Taliban, Raziq claimed to have survived 24 past attempts on his life. CBS News' Ahmad Mukhtar reports that Raziq was an influential figure not only in Kandahar province, but throughout southern Afghanistan. Officials told Mukhtar that the attack took place outside the room where Gen. Miller had been meeting other officials, as Raziq and others were leaving. The attack in Kandahar came a day after a Taliban suicide bomber slammed into a NATO convoy near the capital city, Kabul, killing two civilians and injuring five Czech troops, Afghan officials and the Czech military said Thursday. That attack, which took place late Wednesday in the district of Bagram in Parwan province, also wounded three Afghan civilians, said Wahida Shakar, spokeswoman for the provincial governor. Bagram is about 24 miles from Kabul and is also the home of a sprawling U.S. military base. The attack on the NATO convoy came at the end of a particularly violent day across Afghanistan as tensions rise ahead of the country's parliamentary elections on Saturday. A Taliban bombing in southern Helmand province killed a candidate running in the elections. As CBS News correspondent Charlie D'Agata reports, the Taliban -- and the ISIS faction in Afghanistan -- are doing all they can to disrupt the democratic process. U.S. troops are helping their Afghan counterparts beat back the Islamic extremists. This week, D'Agata joined American soldiers who were in the fifth grade when the war began in 2001, as they directed Afghan forces in operations to clear ISIS-held villages in eastern Afghanistan's Nangarhar province. U.S. commanders on the ground have told D'Agata the fight against the extremists has changed a lot since the American invasion, with a far greater reliance on technology and drones to keep U.S. forces and their allies out of harm's way. Company commander Maj. Kirby Robinson is on his second tour in Afghanistan, and he told D'Agata that, while Afghanistan's forces are reclaiming territory -- sometimes easily -- he wouldn't say they're "winning." "I wouldn't use the word 'winning.' I wouldn't use the word 'losing,'" he said. "I want to use the word 'impact.' I think that's the biggest word -- best word for what we're doing." But with 14,000 American troops still serving in Afghanistan, D'Agata says it may still be too early to know what impact the new tactics are having. Afghan military losses continue to be so high, that the government no longer releases the figures.